The Fiesta de Santa Marta de Ribarteme, also known as the festival of near death experiences, is a slightly odd festival to say the least. It´s held in a small Spanish village, that borders Portugal – Las Nieves, Pontevedra, in Galicia and taking place on the 29th July. The Festival of Near Death Experiences, as its name suggests, is a celebration for those people who have had a near death experience and lived to tell the tale. Saint Marta de Ribarteme is the patron Saint of resurrection. 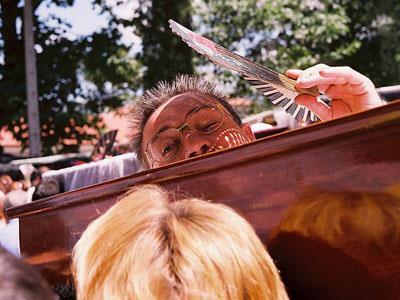 The lucky ‘survivors’ attend the festival in a coffin. It is a good place to go if you want to catch up on tales of different near death experiences. Even though centred around a fairly morbid theme, the festival itself is a celebration with firework displays and the usually partying that carries on well into the following day. Thousands of people line the streets of this tiny village. 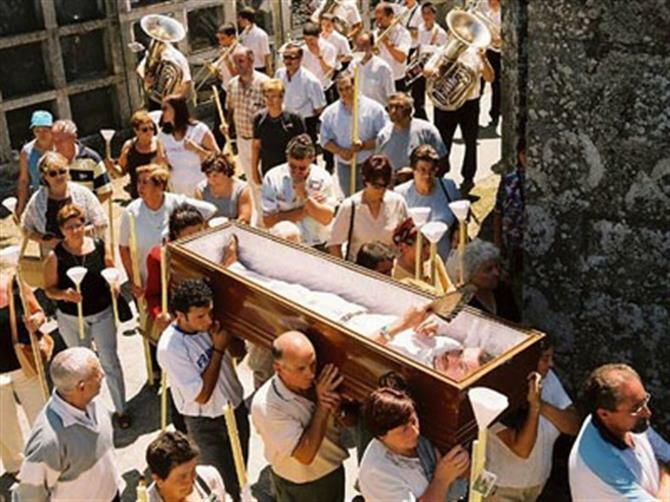 At 10am, the relatives of the people who narrowed escaped death are expected to carry their loved ones in coffins to the small church where there is a shrine to the Virgin Santa Marta. After Mass, which is projected across the village using loudspeakers, the procession then walks to the local cemetery and then back to the church with a large statue of the Virgin Santa Marta overseeing the celebrations. Sure, it's Green Spain. But Galicia's beaches are as stunning as its countryside. Featuring sand that ranges from ivory white to mellow yellow. Cathedrals Beach is considered the most amazing natural monument of the Galician coast and has been declared one of the best beaches in the world. Not everything on your holiday to Tenerife has to cost money. Here are top 10 free things to see and do in Tenerife. Discover the most fun and colourful LGBT festivals in Spain this 2019! The Cordoba Patios Festival - "Fiesta de los Patios"
The Cordoba Patios Festival is a feast for the senses, it celebrates the art of decorating courtyards with hundreds of colourful flowers and plants.